Description: This is a Hot Wheels Doctor Strange car in the Avengers Infinity War Character Cars series. 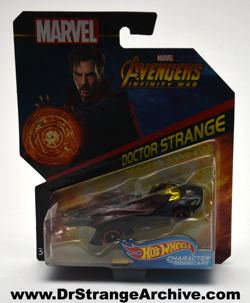 It is the similar if not the same as the 2016 Doctor Strange car with a flowing red cape and gold canopy. Groot, Captain America and Iron Man Mark 50 cars are listed on the back. Several numbers are listed on the card to include: BDM71-0931, 993532-P, FRB34-0910.